Winter Storm Neptune is past. Seems as if the friday through Sunday times as pretty busy with Snow! Today, Monday, the 16th, we cleared the driveway again. This time it is the blown snow that filled the drive. It took another two hours which, by our metrics, represents another foot. 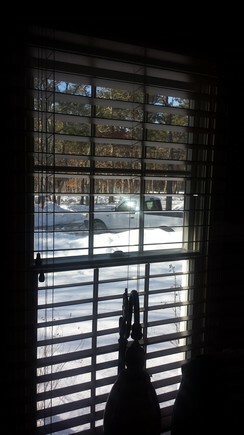 There is an argument being made for a snow blower. And, an argument being made against one. If we buy a snow blower, it will never snow again. Haha! Tooka drive as a reward for digging out the truck. All the usual haunts, Pleasant Bay, Chatham Harbor, Stage Harbor, and Nantucket Sound. Lots of ice on the protected waters. Two views of Pleasant Bay from Route 28 near Round Cove. South towards Eastward Ho and Chatham YC. The other more northerly towards te Narrows. A view from the Harbor Master's Landing in Stage Harbor. Looking out towards the inlet and beach where we had so much fun this past summer. The right side is the Stage Harbor YC facility which is filled with kids in Optis and 420s during the week and adults in Day Sailor class sloops on weekends. At Chatham Light we found the gull cold enough to just put up with people walking by. Nauset Beach in the background with some ice piled up on the inside shore. No big deal but it is snowing and windy and we are comfy in the house doing various chores. A couple of images from this morning show the progress of the snow. The weather Channel is on all the time. I am reminded of the Jimmy Buffett song, Holiday, about the weather channel girl and her perfect weather curl is talking cold, cold, cold.... Yup! Got out to clear the driveway and did the job together in two hours. The drive is about 60 feet long and has another ten feet of a turning pad. Then, we have to dig out the area around the mail box. Not to worry, a plow will shovel street snow up in front of all the cleared areas and I get to go again. The gift of winter. I gather we got a bit over 12 inches before the sun broke through. Still cold as the dickens. 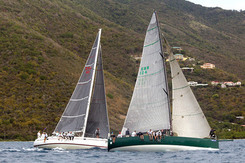 Logged on to Caribbean Sailing Association web site to fantasize about the regatta calendar. February 14th, 2015... Neptune, the Valentine's Day Storm is descending. Filled the car and truck with fuel, bought an extra box of Malbec anti-freeze, and planned a couple of yummy meals. In anticipation of the "big event" I took some pictures of the state of play before Neptune shows up. Herewith are a couple of samples. A view from the library through the window looking out to the front of the house and driveway. The garage viewed from the side of the house. The blue spruce is in the foreground. Robins nested there last year. 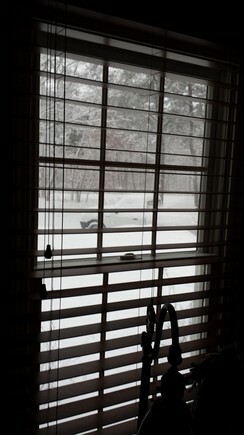 View out the front door. If we get another foot of snow, it takes about four hours to shovel our way to the street and make a path for the truck, as well. Once upon a time, Norm spent winters in the Caribbean. 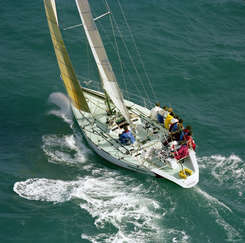 Pictures of two boats he sailed, Rumor, ex-Evergreen and Three Harkoms with Yeoman. Oh well.... snow or sail?